It’s one of the most enduring adventure tales of all time—a coming-of-age story featuring swaggering pirates, sea battles, and a quest for buried treasure. First published in a weekly literary magazine between 1881 and 1882, Treasure Island wasn’t the first novel about a boys’ fantasy of fighting murderous Buccaneers. But with its richly drawn characters, vivid prose and moral complexities, it became the defining work of that genre, and a classic to boot. It also introduced readers to one of the greatest villains in all of literature: the one-legged, parrot-wearing Long John Silver. 1.THE IDEA CAME FROM A MAP STEVENSON DREW. 2. STEVENSON WAS 31 YEARS OLD, JOBLESS AND FINANCIALLY DEPENDENT ON HIS FATHER. Stevenson had been a sickly child who developed weak lungs as an adult (most likely through a congenital disease like sarcoidosis). This meant he was constantly traveling in search of dryer climes beyond his smoky, rain-soaked Scottish hometown of Edinburgh. He spent time in northern California, New York, the French Riviera and, at the end of his life, Tahiti and Samoa. His father, a lighthouse engineer, was disappointed that his son didn’t follow in his footsteps, but he still served as his patron and was an enthusiastic collaborator on Treasure Island. 3. HE WROTE A CHAPTER A DAY AT FIRST. Seized by his idea, Stevenson was able to write a chapter in the morning, then share what he’d completed with his wife, Fanny, and the young Lloyd in the afternoon. Lloyd’s enthusiasm for the story, Stevenson noted, fueled his work. 4. THEN HE CAME DOWN WITH A MASSIVE CASE OF WRITER'S BLOCK. Somewhere around Chapter 15, Stevenson froze up. He couldn’t figure out how to resolve Jim’s story after stranding him on the island. After weeks of trying to find the thread again, Stevenson decamped from Scotland to a small chalet in the Swiss Alps. The change of scenery, which may have also improved his health, brought back the muse. 5. ITS ORIGINAL TITLE WAS "THE SEA COOK." The name refers to Long John Silver, who serves as the cook aboard the Hispaniola. It was an indication, no doubt, of Stevenson’s preoccupation with his charming pirate, and an acknowledgment of the character’s paradoxical nature (the title of cook was oddly humanizing for a villain). Stevenson’s publisher convinced him to change the name, and it first appeared to readers as Treasure Island: Or the Mutiny of the Hispaniola. 6. IT FIRST APPEARED UNDER A PSEUDONYM. 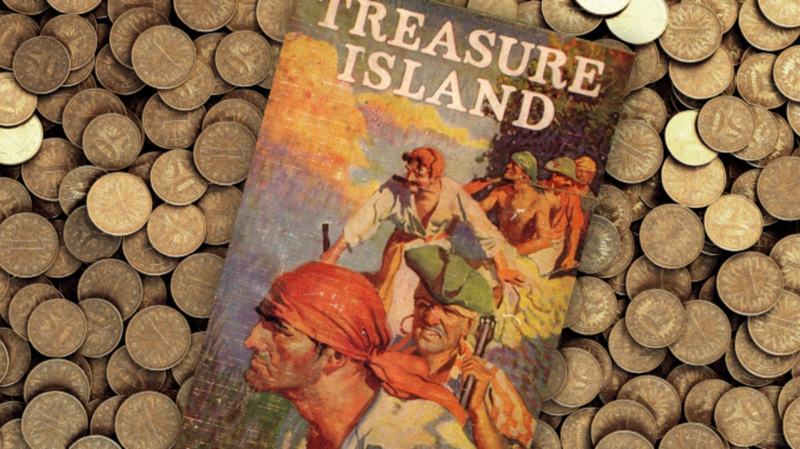 The publisher of Young Folks, a weekly literary journal for boys, agreed to publish Treasure Island in what would eventually become 18 weekly installments. Stevenson relished the opportunity, but published under the pseudonym Captain George North. He never articulated why, exactly, though he was probably worried about sullying his family’s good name if the story was poorly received. His wife, Fanny, also hated Treasure Island, thinking the work beneath her brilliant husband. Before it was published as a separate book, she wrote: "I am glad [poet Edmund] W[illiam] Gosse likes Treasure Island. I don't. I liked the beginning, but after that the life seems to go out of it, and it became tedious." 7. READERS DIDN'T LIKE IT TO BEGIN WITH. Apparently the story moved too slowly for the lads who subscribed to Young Folks. As one of the editors, Robert Leighton, put it, “They were kept dragging on week after week with preliminary matters connected to the inn. They wanted to get to the sea, they wanted the treasure hunt.” It was only after Treasure Island came out in book form that the story became popular, reaching a wider audience of more patient readers. 8. LONG JOHN SILVER WAS BASED ON A FRIEND OF STEVENSON'S. 9. THE BOOK PAYS HOMAGE TO REAL PIRATES AND MILITARY MEN. Stevenson references several real-life pirates, including Blackbeard, William Kidd, and Bartholomew Roberts. Israel Hands, one of Silver’s men, who dies a bloody death at the hands of Jim Hawkins, was the actual name of Blackbeard’s second in command. Treasure Island also alludes to British naval officers on the other side of the fight, like Admiral John Benbow (“The Benbow Inn”) and Admiral Edward Hawke. 10. THE VIOLENCE WAS SHOCKING FOR THE TIME PERIOD. Whether he were injured much or little, none could ever tell. Like enough, to judge from the sound, his back was broken on the spot. But he had not time given him to recover. Silver, agile as a monkey, even without leg or crutch, was on the top of him the next moment, and twice buried his knife up to the hilt into that defenseless body. From my place of ambush, I could hear him pant aloud as he struck the blows. 11. STEVENSON'S FATHER MADE NUMEROUS SUGGESTIONS THAT ENDED UP IN THE BOOK. Thomas Stevenson loved pirate tales, and he gave his son some helpful advice. He suggested that Ben Gunn, the sailor marooned on Treasure Island, be a religious fanatic rather than a tormented soul, and that Captain Flint’s vessel be named The Walrus. He also came up with one of the book’s pivotal scenes, in which Jim hides in an apple barrel and overhears Silver’s plan to mutiny. When Treasure Island came out in book form, Stevenson’s original map was printed along with the “signature” of Captain Flint, forged by none other than Thomas Stevenson. 12. LONG JOHN IS ONE OF THE TRULY GREAT CHARACTERS IN CLASSIC LITERATURE. Silver is a complicated villain who charms the reader just as he charms young Jim. The one-legged captain is whip-smart and frequently funny, uttering lines like “shiver my timbers!” and toting around a parrot on his shoulder named after his old commander, Captain Flint. He’s a jaded man, a former seaman in the Royal Navy who lost his leg fighting for the Empire, and there are glimmers of his former decency, like when he keeps his men from killing Jim after capturing him on the island. But he’s ultimately a lost soul corrupted by greed. 13. SCHOLARS AND FANS HAVE LONG PUZZLED OVER THE LOCATION OF TREASURE ISLAND. The references to rum running and Mexican Indians would seem to indicate its location somewhere along the Spanish Main. But then what about the rattlesnake the Jim meets on the island, or the stands of live oaks, or the sea lions he sees—none of which exist in that area? Stevenson’s island seems to be a hodgepodge of geographic details, a place found only in the imagination. 14. THERE ARE MORE THAN 50 FILM AND TV ADAPTATIONS. From silent films to The Muppets, there have been numerous cinematic takes on Stevenson’s classic. Orson Welles, Charlton Heston, Tim Curry and Anthony Quinn are among those who have filled the role of Long John Silver. Check out the 1990 made-for-TV version (starring Heston and directed by his son, Fraser) to see a young Christian Bale as Jim Hawkins.